(Barnes & Noble.com) In an interview with his publisher, Dr. Karasu talks about his latest book, The Spirit of Happiness. Why did you write The Spirit of Happiness? I have practiced psychiatry for the last thirty-five years. I have written many articles and books about psychological care and sought out factors that might help people to be happy. I've studied the works of many psychologists and philosophers, and I have read the popular books that explore sources of happiness and the meaning of life. They deliver advice on self-actualization, success at work, relationships, marriage, worldviews and philosophies of living. The proliferation of these "self-ultimacy" books validates my conviction that the answer to the human dilemma can't be found in the realm of the mind. The works of secular gurus demonstrate again and again that making the mind of man its own center generates only personal confusion, unhappiness, and communal disorders. In my book, The Art of Serenity, I identified six tenets of soulfulness and spirituality as the basic requirements for happiness: The Love of Others, The Love of Work, The Love of Belonging, Believing in the Sacred, Believing in Unity, and Believing in Transformation. I emphasized that a secular person may cultivate these extraordinary tenets but it will be difficult to maintain them without divine inspiration. 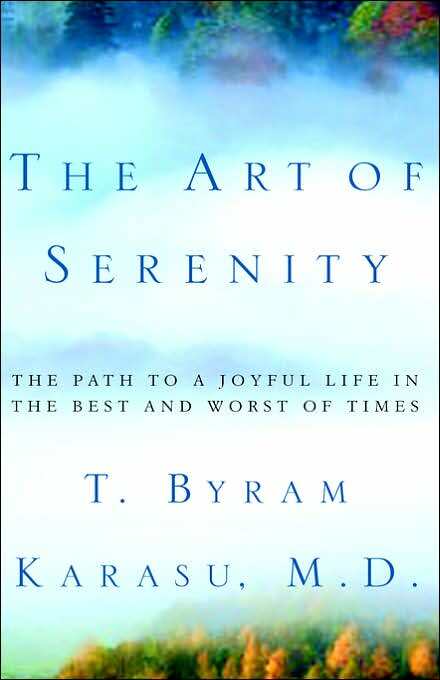 This book begins where the Art of Serenity ended, with the belief in and the love of God. This book will guide you to the next and final step: To become godly. To believe -- to have faith -- in God means trusting that there is a reason for the existence of everything in this world and beyond, and that there is meaning in its mystery. It means believing that there is a Holy Purpose. To be godly means to resonate with God's Holy Purpose, to bring all your personal and mundane purposes under its umbrella. If you not only have faith, but also become godly, you'll be a recipient of God's help, friendship and boundless generosity in every aspect of your life. In this book I use the Bible as the only source of reference. Throughout the centuries, men and wisdom have praised the Bible's guidance for truthful living; its cheerful urgings of love and compassion; its eternal lessons of serenity amidst the tribulations and adversities of the world; its tender teachings of the mysteries of life. As Heinrich Heine says in Ludwig Boerne (1840), "Great and wide as the world, rooted in the abysmal depths of creation and rising aloft into the blue mysteries of heaven...sunrise and sunset, promise and fulfillment, birth and death, the whole human drama, everything is in this book. It is the Book of Books, Biblia." I am not a man of the cloth, merely a student of the human dilemma. Any theologian who reads this book will easily see the hand of a layman at work and I hope will forgive any of my shortcomings. With that proviso, I will present how you can find God's Holy Purpose and become godly. I will describe what godliness means in all aspects of your life, ranging from your career to relationships with your spouse, children, friends, colleagues and even strangers. Only by being godly can you be strong and successful, find joy and happiness, and live an extraordinarily meaningful existence while leading an ordinary life. Happiness is a state of serenity, an inner peacefulness that is the culmination of six factors which I describe in the book: 1) the love of others; 2) the love of work; 3) the love of belonging; 4) believing in the sacred; 5) believing in unity; 6) believing in transformation. How is happiness in adulthood different from the happiness commonly associated with the lost paradise of childhood? The happiness that we associate with childhood is related to a sense of omnipotence, immortality, and an unbridled self-entitlement. It derives from an infantile return to blissful merger with mother, a regressive union without self-boundaries or responsibility. In adulthood, these same sentiments only bring unhappiness (frustration, fear, rejection). Instead, adults need to strive for reciprocity, compassion, realism and coming to terms with one's mortality. It is cultivation of others' gardens. Your book revolves around the concepts and actions of soulfulness and spirituality. Could you explain what you mean by being a soulful and a spiritual person? The soulful person is one who is patient, generous, forgives mistakes of others, accepts his loved ones as they are, who protects their privacy and solitude, values their interests, celebrates their peculiarities, and seeks no perfection in others. The soulful person is committed to this work energetically and enthusiastically. The ones who harness themselves to their work are like an "ox to a heavy cart;" they burn like a good bonfire, not like a "smoky fire." The soulful person goes down uncharted roads in order to grow full and strong. The spiritual person "kneels at the feet of all creatures," values everything but holds them loosely. He seeks simplicity and the wisdom of ordinariness. The spiritual individual gratefully wants what he already has and smiles with a sacred optimism. The spiritual person believes that we all share a common well, a divine womb. In a state of feeling oneness with the universe, he doesn't capture things but beholds the world as one might look at stars. His or her love is a love with no object. It is just love. By such love, passion is transformed to compassion, with joyful recognition that no seed ever sees its flower. The spiritual person believes in continuity, that we are finite in our presently expressed form, eternal in all other potential forms, that humans, animals, and vegetation all are one product, that eternity is living everywhere and everything. Why is self-love the first step toward true joy? What distinguishes this vital quality from self-serving narcissism? Benign self-love is self-recognition and self-acceptance. Without that, one cannot love others. Loving others begins with the internalization of being loved. Self-serving narcissism is not self-love but self-doubt, if not self-hate. Such persons would go to any extent to be the center of attention at the expense of others, including drowning them in their own pathology. In contrast, self-love goes beyond the self; it is egoless. What are some of the key mistakes men and women make in their quest for a soulmate? Some of the key mistakes incorporate the erroneous belief that the other person must compensate for one's own sense of failure or unhappiness, must somehow supply what is felt to be missing. Such mistakes manifest themselves as blaming each other, never apologizing, enmeshment with each other, not forgiving (and forgetting) discretions and mistakes, demanding that the other person be like himself (or herself) i.e., normal; not tolerating their peculiarities, never mind the celebrating their differences. Given today's unstable economy and competitive pressures, work has become a source of anxiety for workers across the board. Is it possible to find real satisfaction in any job? The absence of work generates depression, lowers one's self-esteem and weakens one's immunological system. Descarte's motto, "I think therefore I am," should be replaced with "I work therefore I am." Without work, a person not only may not be able to survive financially but is also psychologically bereft. Our work provides a framework for our usefulness. In that sense, cleaning streets or teaching students share the same commonality. On the other hand, there are people who have jobs but are unhappy in what they do or where they do it. It is true that some jobs are easier or better paying than others or better located. However, these factors do not determine one's happiness or unhappiness at work. Such people need to self-reflect, to tease out the unsatisfactory aspect of the job as they perceive it from their personal disposition for dissatisfaction. Some people who complain about their jobs tend to be simply less competent in their specific tasks (thus not rewarded or praised by their superiors) or/and less competent in interpersonal relationships (thus either rejected by their co-workers or frequently in conflict with them). Therefore, inevitably unhappy, they will have the same situation no matter what job they take. Some other people expect their jobs to provide everything that is missing in their lives, including the meaning of life. They complain about the "meaninglessness" of their work. There is no meaningful or meaningless work; there is only work. The meaning is extracted from any type of work by making a full commitment to it. Meaningfulness is a by-product of one's engagement with one's work. The magical process of transmuting ordinary work into something of true merit requires love of one's work (even seemingly unlovable work) and putting one's signature on it with full energy and singular attention. Such people, whether a doorman or a CEO, have glitter in their eyes. This is the glitter of self-love and self-confidence because as Thomas Moore says, "the love that goes out into your work comes back as self-love." Why is a sense of belonging crucial to happiness? How can people who live in a guarded suburb or fragmented city far away from their families and close friends begin to create a sense of community? One can't be happy in isolation. We are social animals; we cannot survive alone. Without a bounded mooring, we are too anxious to be happy. The amorphous threat of the infinite from without and from within has a disorganizing effect on the mind. The basic structure of community imposed upon the individual (no matter how much we complain about it) provides the security of belonging. Cut flowers don't last long. Communion makes our sorrows bearable, offers the salvation of restraint and an alternate psychological home when needed. People in fragmented communities have to make even greater efforts to belong. The cohesiveness of their immediate family becomes even more important for their wellbeing. Through various media, they have to attempt to establish contact with their extended families, schools, social clubs, and/or religious affiliations. How can life's greatest challenges -- failure, illness, loss -- actually bring people closer to experiencing lasting, joyful serenity? Failures are as ephemeral as successes. Both are simply blessed illusions. It is like falling down and getting up. It is still you. The failures validate not only one's limitations but also one's potentials. Losses are partly self-losses. There is no comfort and consolation needed. The divine light is embedded in the darkest shadows that can transfigure that unbearable pain into quiet serenity. Each person who comes through this world is called upon at some time or other to bear some of the weight of the pain that befalls the world, says Gary Zukav. You must learn to hurt better and you must be worthy of your suffering. Illnesses are just extensions of one's health. Everyone gets sick sooner or later. It is the most beaten path. Illnesses are also sacred signals, telling us of our need for realignment and giving us the opportunity to reframe our lives. They may contain messages from the depths of one's psyche that one may be on the wrong track, in the wrong profession, in the wrong relations, in the wrong town, etc. The person must first shift the valence of his life from suffering to calling. One must also focus on not what is wrong with one's body, but on what is right; not with what is broken but with what is not, and remain in harmony with one's divine discontent. But what happens when one does not tolerate life's challenges well? Those who do not adjust well to life's challenges excommunicate themselves. They would be alienated from their families, their colleagues at work and their friends. Their nostalgic preoccupations and chronic frustrations are depressive and contagious. Therefore, people tend to avoid them in self protection. What do you see as the toll of our national loathing of old age? What advice can you offer for aging gracefully, in body and in spirit? Youth and beauty are definitely praiseworthy for their age-specific criteria. Old age gets loathed if viewed by the same criteria. The old people's self-loathing is partly responsible for this. We do not have a coherent philosophy of aging. Instead of a dignified melancholy of aging resonating with old age, we angrily fight it and slip into a kind of neurosis of aging. Acceptance of aging brings some ripe sadness and light anxiety, which could bring out the depth and flavor of one's character. Aging gives weight and density to one's personality. It distills the various lifelong experiences into a meaningful whole. It allows one's thoughts, beliefs and values to coalesce into a life philosophy. Now that is worthy of praise. Why do nature and history matter to personal happiness? Happiness cannot occur in isolation from one's fellow beings or from nature. The self is best experienced by being part of a greater universe, by blurring of boundaries between human, nonhuman, light and space. In a great chain of beings all is continuous and homogenous. We are happy if nature is happy because we are part of nature. The communion with nature is a sacred source of joyfulness. As to history, our state of mind is influenced by our personal as well as our archetypal past -- the collective unconscious, which is multigenerational and always preempts the personal one. Our collective past frames our individual present. Our myths are our mutual philosophy. Without them we are alone. History provides continuity with our past and the prospect of learning from it for the future. What words of wisdom can you share for coping with the ultimate fear – dying? How can the terminally ill and their loved ones still find happiness in life? The fear of dying is universal because of the uncertainty, pain and loss associated with it, as well as our not being able to comprehend the idea of "no longer being." This fear is intensified and becomes a dread when one's sense of self is too closely identified with external factors. That is, the less one knows oneself, the worse the fear. The process of dying must be lived. Commonly, not having lived preempts that experience of dying. It is difficult to find happiness at the time of one's own terminal illness or that of a loved one, if the person has not cultivated a philosophy of life and death earlier in his/her life. Such a philosophy can be highly personal or communal, i.e., religion. My personal philosophy is as follows: "eternity" -- permanency -- is the result of a combination of transitory factors; becoming "nothing" is the path to being everything; primordial dissolution is the ultimate serenity. Life is an eternal recycling. We are finite in our presently expressed forms but eternal in all potential forms. Meanwhile, I would suggest that you should not waste time by despairing in thinking of your end, just come to terms with it, and drink deep from the well now. In your book, you make a powerful case for the importance of religion. Why can't a person live a good and genuinely happy life without adhering to any church's doctrine? A person can live a good and genuinely happy life by being soulful and spiritual without adhering to any religious doctrine. Religions serve many purposes, including those of providing a congregation, identity, and a ready-made paradigm for living. They promise continuity with the past and the future, and eternal belonging. Religion is a communal matrix. It is very difficult to formulate an individual paradigm to meet all of one's needs. Some can make it and even flourish; most others need to be planted next to a stream of religion for survival. Even secular spirituality rests on the tenets of religion. Why do you believe that people all over the planet overwhelmingly and innately believe in God? When you look at the enormity of a starry night in which time and space seem interchangeable, or you think of the myriad of transmitters and hormones that control your body, you are awed and frightened. Then you wonder: does all this represent the visible programming of the universe by an invisible force? Jung says that we are wired for God, the programmer. It is an instinctual yearning. We need to relate our existence to a greater force, especially at times of the impending loss of a loved one or during severe illnesses. We believe, therefore we are. This innate belief in God infallibly ties all loose ends, frames our lives, gives aim to our existence, provides meaning for our God-like behavior -- caring, compassion, mercy, goodness, justice, etc. God is love, God is truth, God is humility, God is accountability. We want that. God is an ascetic surrender and sum of all virtues that we long to emulate. We want to receive the reward of having little to apologize for or to repent of at the end of our lives. What would you most like readers to gain and put into daily practice from their encounter with The Spirit of Happiness? I would want them to make a quantum leap to reframe and enjoy their lives by being godly: learn the nature of real love and holy relationship; learn how to extract meaning from seemingly meaningless works; learn how to knit ourselves into a convivium (living together) with others and in nature; explore a reality other than that of our five senses; happily experience the God within, and tap the underground river of spirituality -- to be optimistic and serene. Ultimately, I would want them not to be afraid of illnesses, despair, losses or death, to give an aim to their life (fortunes as well as misfortunes) and death. This is a wonderful world! In the winter of 2003, T. Byram Karasu, M.D., answered some of our questions"
What was the book that most influenced your life? A biography of Albert Schweitzer. Here was a man, an accomplished musician, writer, and professor of theology and philosophy living in the comfortable civilized world of Strasbourg, who decides to become a physician. He leaves everything behind him and goes to Africa to help natives without any conventional gains associated with it. If anything there would be all sorts of losses: financial, health, and even danger to his life. For example, he was detained in an old French mental hospital as a prisoner of war during World War II. This was the first time I heard of someone intentionally serving others without any obvious benefit for himself. That totally confused me. I was only 11 years old and just learning the nature of reciprocity in human relationships. Schweitzer's behavior betrayed common sense. Some adults explained his behavior cynically: "He must have been running away from something! "; "He might have wanted to be famous! "; "He was having a sort of nervous breakdown! ", etc. Full-text of the interview available, click here.